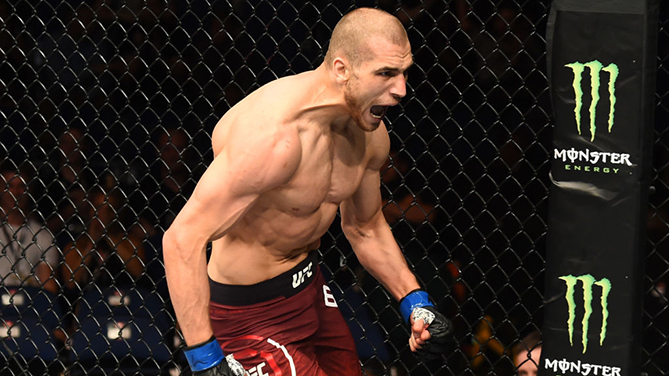 In his first fight since June 2016, British middleweight prospect Tom Breese got back in the win column, showing off top form in stopping Australia’s Daniel Kelly in the first round of their UFC Fight Night prelim bout at Echo Arena in Liverpool. Breese and Kelly took their time getting into a rhythm on the feet in the early going, with Birmingham’s Breese the sharper of the two with his strikes. Then out of nowhere with a little over 90 seconds left, Breese scored with a left uppercut that forced Kelly to move back to the fence as he held his eye. A knockdown and follow-up strikes from Breese ensued, prompting referee Daniel Movahedi to step in and stop the fight at 3:33 of the opening frame. With the win, Breese moves to 11-1. Melbourne’s Kelly falls to 13-4. In a bantamweight bout, No. 14-ranked Lina Lansberg won a three-round unanimous decision over No. 15-ranked Gina Mazany. The first round was fought almost entirely in the clinch against the fence, with Lansberg (8-3) controlling matters but not doing much in the way of significant scoring. It went right back to the cage to start round two, but after a restart from referee Marc Goddard, Mazany (5-2) scored a quick takedown before it got back to the clinch against the fence. Midway through the round, the two separated and exchanged solid shots, then clinched once more. With 1:35 left, it was another takedown from Mazany, but she wasn’t able to keep her foe grounded for long, and it was close range fighting on the feet until the horn. The third round was another close one, but Lansberg’s control in the trenches was more than enough for the Sweden native, who emerged victorious via scores of 30-27 twice and 29-28. Octagon newcomer Carlo Pedersoli came in on a week’s notice to face Brad Scott and he made the most of it, defeating the British veteran via split decision in welterweight action. Scores were 29-28 twice and 28-29 for Rome’s Pedersoli, 11-2, who replaced Salim Touahri. Melksham’s Scott falls to 12-6. Pedersoli seemed unaffected by the first-time UFC jitters as the first round progressed and he and Scott got down to fighting matters. But with less than a minute remaining, a left punch by Scott put the Italian on the deck, and as he rose, Scott dropped him again with another left. Pedersoli recovered well, though, and he made it out of the round. Back in business, Pedersoli’s busy attack served him well on the feet, and he even threw in a late takedown for good measure as he evened things up with the Brit. In the third, it was more of the same, with Pedersoli the more active fighter throughout, both with his striking and takedowns. Canadian flyweight prospect Gillian Robertson spoiled the UFC debut of hometown favorite Molly McCann, submitting “Meatball” Molly in the second round. McCann kept the fight where she wanted it on the feet in the early going, but Robertson held her own with the former amateur boxing standout until she got the bout to the ground with three minutes remaining. On the mat, it was all Robertson, who dominated the action to the horn. McCann dodged Robertson’s first takedown of round two, but the second hit the mark, and this time, Robertson was able to get McCann’s back and sink in the rear naked choke that ended the bout at 2:05 of the second stanza. Robertson moves to 5-2 with the win. McCann, who weighed in at 127 pounds for the bout, falls to 7-2. Toronto middleweight Elias Theodorou picked up his seventh UFC victory in the opener, pounding out a hard-fought unanimous decision over Trevor Smith. Scores were 30-27 twice and 29-28 for the No. 15-ranked Theodorou, who improves to 16-2. Smith falls to 15-8. Theodorou fought a solid first round, landing good strikes at distance and at close range, though Smith was able to keep it close due to his grinding attack in the clinch. Smith did a good job of getting the fight to the mat a couple times in the first half of round two, but the trips south were brief and Theodorou was still landing the harder punches as the two battled in the trenches. With under a minute of left, a clash of heads opened a cut on Theodorou’s face, prompting a visit from the doctor, but he was cleared to continue and the two were headed to a third round. Trying to keep it at range early in round three, Theodorou’s plan went awry when he was taken down with three minutes left. A minute later, it was the Canadian’s turn to take the advantage on the ground until the two rose to finish up the grueling battle on the feet.